Port of Entry opened this week at the Sun Pier House Gallery in Chatham, the work on show is produced in response to travels and research around the nature of visual collecting and transcription from sketchbooks, from cultures and communities as diverse as Shenzhen, Guangzhou, London and Chatham. It looks at the nature of the language of man-made objects as symbols, both recognised and remembered or shared, in terms of agreed knowledge and narrative. These initial observations and memories have been translated into a series of drawings which respond to the nature of visual motifs and metaphors commonly associated with home-spun shared knowledge embedded in the decorative nature of ceramics and textiles. This has culminated in a series of commissioned cross stitch embroideries working with designer maker Linnet Hannan, transcribing the drawings in to a cotton, cross stitch language associated with both traditions of European samplers and rural embroideries from China. The work will also be shown in October at the Eagle Gallery in Clerkenwell, London as part of Agency, an exhibition showcasing the work of artists who make up The Artists Agency. Artists Agency of which I am a selected artist. Port of Entry is a range of new drawings, prints and embroidery by Gary Clough exploring architectural space and geographical locations, while challenging notions of the imagined, the remembered and the known. In addition Clough is shaping an individual response to the different cultures engaged within his travels through China and the UK. Shaped Narrative House 2017 30×30 Gary Clough Ink on Paper. The images emerge from the habitual practise of drawing that artists use to explore and process the world around them. These drawings, most often contained within the intimate and private spaces of the sketchbook, happen when no one is looking, a form of practice that keeps the muscles of the hand, eyes and imagination working together, constituting a speculative work of re- imagining. The sketchbook is an intrinsic part of Gary’s practice, operating as both virtual and literal studio and collective cognitive landscape. The pages demonstrate how ideas are both generated and revisited in a constant process of analysis and reflection. It is driven by an innate playfulness and an ongoing discourse with the nature of the perceived, known and made.The sketchbooks innate mobility is clear in the pages as they document the artist’s journeys, stopping offpoints and destinations through geographical, historical and disciplinary visitations and positioning. For the first time, Clough has made new works utilising cross stitch approaches, borrowing from its tradition as a homespun practice for documenting personalised interpretations of the world and mirroring his use of the sketch book as a starting point for assimilating the made environment. The work plays with the notion and challenges of the transformation into motif associated with this craft tradition, combined with the blue and white pallet associated with rural Chinese embroideries. The work in Port of Entry engages further with the notion of a shared entry, or starting point in the development of a repository, or archive of a highly personal genus of objects arranged and presented as sets, families and suites of images. The genealogy and heritage of the images draw from influences as broad as the pages of the Argos catalogue and the shelves of B&Q and Pound Land, to the Song and Tang dynasty blue and white Chinese ceramics, to the cotton indigo embroideries of 18th century rural China. 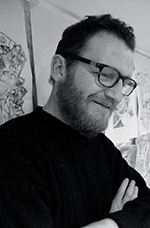 Clough has focused on developing contemporary notions of patterns and symbols as visual metaphor, intrinsic to global traditions of shared and/or remembered narrative histories within the creative industries and its cultural currency. The work attempts to investigate further contemporary notions of and relevance to the use of visual metaphors, motifs and symbols generated in the traditions of the decorative object essential to the sharing and evolving of shared visual language over generations through mnemonic and cultural exchange and interaction. The work displayed in Chatham allow Clough to develop new drawings and new ways of working in the context of the architectural spaces and this geographical locations. The project’s location in Chatham is essential as it directly engages with its position as a key cultural gateway and interface historically, for the UK which draws from an existing community who share the cultural heritage of the images, mark making, pattern and colour of the work. Chatham’s historical positioning as a key military and commercial port and literary and narrative heritage is a conscious influence and reference for the artist’s 20 year association with the location and communities. The exhibition also enables the engagement with the broader community of Chatham through national and international connections through the Universities and Education sector, supported by an artist talk and lecture. Working with Shenzhen National Art museum and Sun Pier House, Chatham and supported by the Artist Agency I am in the process of developing new work for an exhibition in April, May and August, September. Port of Entry is a new body of work developed from sketchbook images, informing a series of large, site-specific wall drawings, inferring a connection between Shenzhen and Chatham. Port of Entry investigates the idea of a port, not only as physical gateway, but also a conceptual notion of entry point for cultural and social information exchange and discourse. The second part of the project will be a another series of site-specific wall drawings developed from images produced in Shenzhen. These drawings will be developed through workshops with Primary school students, investigating the nature of the imagined and remembered. The project will culminate in a publication which will document the exhibitions and the ongoing dialogue between the artist and the two locations. Trace Engines – The Brewery Tap – UCA Project Space: Folkestone Triennial 30/09/17 – 03/10/17. Private View 29/09/17 – 6pm – 8pm. I will be showing the Trace Engines project as part of the Folkestone Fringe, at the Brewery Tap – UCA Project Space, from the 30/09/19 – 03/10/17. 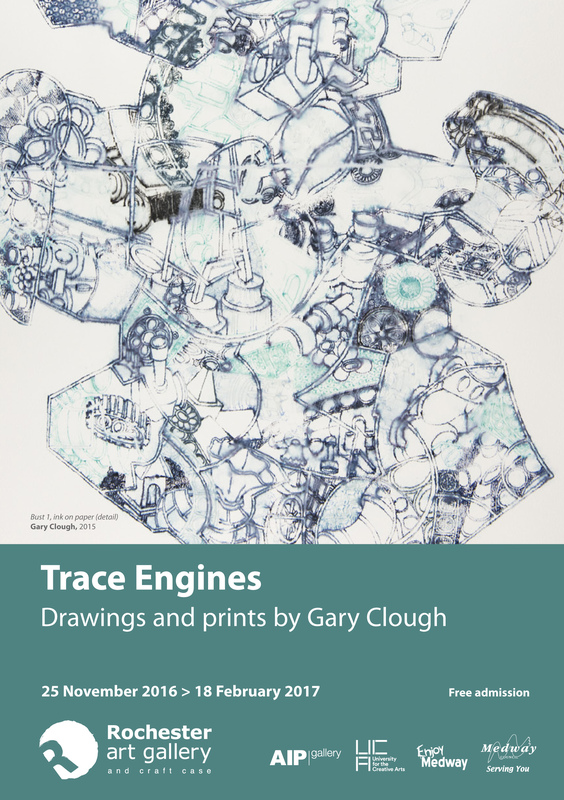 Trace Engines is a body of work produced through UCA research funding, in collaboration with AIP Gallery, Guangzhou, China. The work was previously exhibited at Rochester Art Gallery, November 2016 – February 2017. I will also be exhibiting a series of new drawings entitled Shaped Narratives. The Private View will be on the 29th September, from 6pm – 8pm, all are welcome. 53 Tontine Street, Folkestone, CT20 1JR. I will be invigilating the exhibition and of course working in my sketchbook between the 30/09/17 – 03/10/17. The Brewery Tap – UCA Project Space is a research hub, exhibition and project space run by the MA Fine Art and MA Curatorial Practice courses at the University for the Creative Arts in Canterbury. I am delighted to have been asked to contribute to this project and the broader Folkestone creative quarter and community and the Folkestone Triennial. FUN DRAWING: Pre-School Art and Design, curriculum development and delivery. 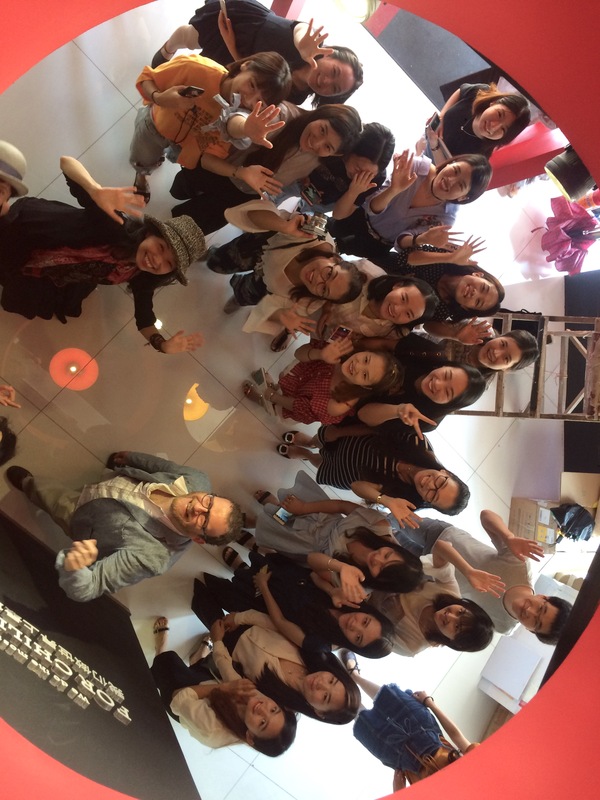 In early August I was invited to Shenzhen, China as the external consultant for the Fun Drawing company. Fun Drawing specialises in pre-school art, design and creative classes for students between the ages of 4-12 years. Fun Drawing have over 20 years experience in the field of creative education and have over 100 schools across the major cites in China. 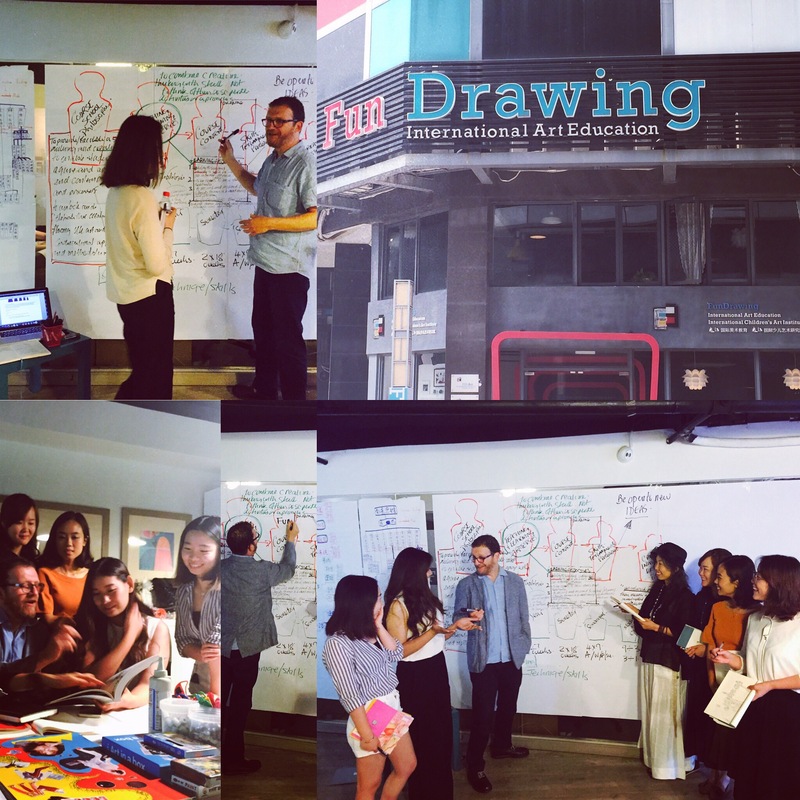 I spent a week in Shenzhen working directly with Fun Drawing’s research and development team, reviewing current curriculum and teaching methodologies. It was my role to develop approaches to integrate and adapt UK art, design and creative teaching, learning, theories, strategies and approaches into the curriculum. Across the week, we worked together to develop a range of new projects, looking at the learning styles and interests of the different age groups. The focus was on developing a more holistic approach to skills acquisition and competencies and also greater integration of creative thinking and action based learning, directly linked to UK creative education models and practices. One area of key research was the identification and use of primary research sources, in the form of integrating gallery and site visits into the programme of study. This led to taking 30 students to the the Team Lab Exhibition and Research Project, in Shenzhen. 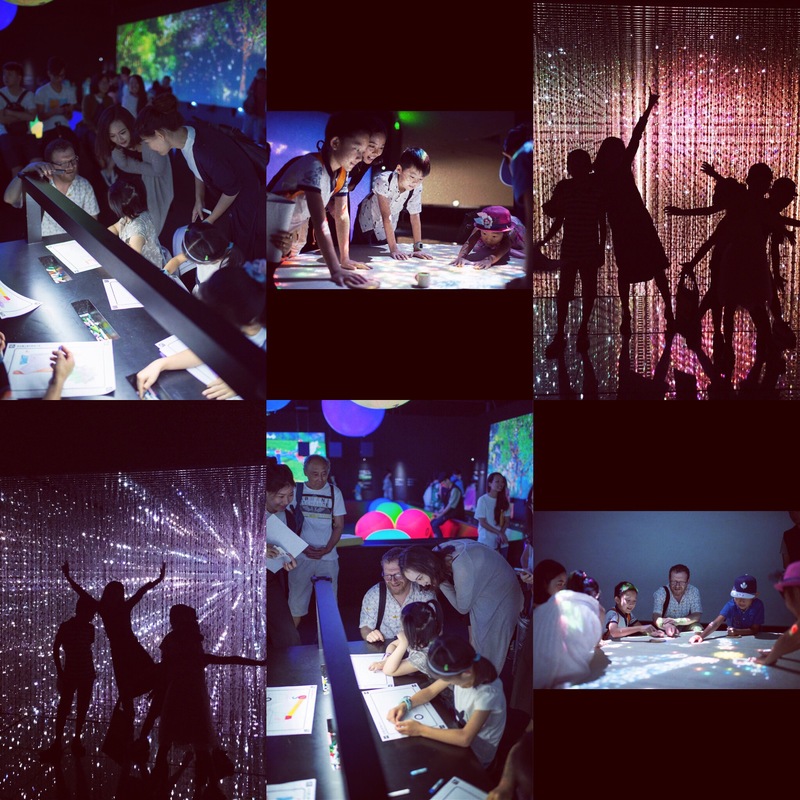 The exhibition led by a group of artists from Japan focused on the application of digital, interactive light based installation and technology. The drawings produced were then used to instigate a class in the teaching studio, where students expanded on their experiences and drawings through collage, drawing and painting. This was a extremely exciting, simulating and rewarding experience. I was also able to meet with the children’s parents, over 60% of them had studied in the UK and/or the US and high valued their experience and hoped their children would also have such opportunities in the future. I’m looking forward to the next stage of the project and the implementation of the newly developed curriculum. I will be returning to Shenzhen in October, to speak at Fun Drawing’s Annual Conference and present the current research and development. 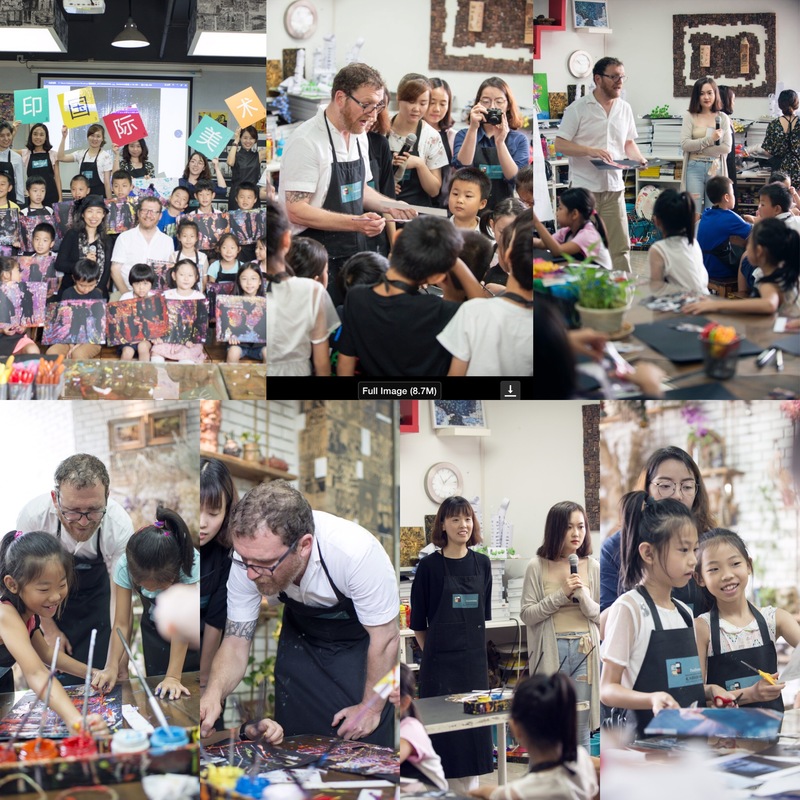 Off to Shenzhen China today, for a week visiting with colleagues in Fun Drawing, taking part in a series of development sessions and demonstration classes. As ever, I will be drawing and developing ideas in sketchbooks, 12 hour flights are always productive. China Blue seems appropriate. Below is a snap shot of current work developing further approaches to the ‘Penny Dreadful’ object/narrative idea, engaging with shaped narratives and applied structure. Sketchbooks are an intrinsic and integral part of my practice, a place where I collate, record and synthesize viewed and remembered experiences. I am currently obsessed with comicbook-like hieroglyphs, in search of or potentially reliant on a visual equivalent to the Rosetta Stone, combining the recognized, the invented and the possible. These draw from a range of real and imagined destinations and cultural references, many from regular visits to China. New work in progress, drawings and prints developed from recent journeys in China. As part of the South East Open Studios. Over two weekends 15-18 and 22-25 June, showing alongside Heather Haythornthwaite and Sarah King at the Hazelnut Press. 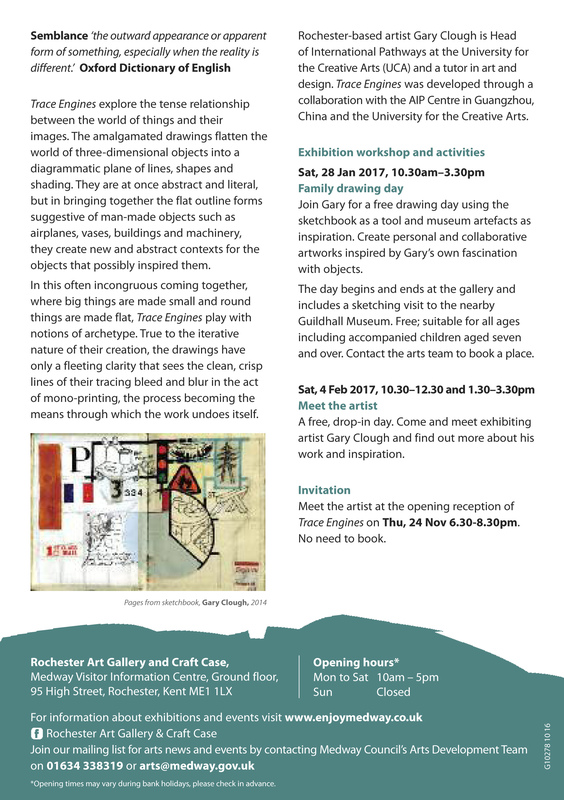 The first UK exhibition of the Trace Engines project, which included a solo exhibition of drawings and mono prints at the AIP Gallery, Redtory Art Zone, Guangzhou in 2015, opens on the 25th November 2016 at the Rochester Art Gallery, Kent. The private view is on the 24th November from 6:30pm and there will also be a series of workshops and artist’s talks that accompany the exhibition. This current show, from 24.11.16 to 20.02.17, brings together new work and pieces produced during my residency in China. I had the great honour to be invited to speak at the Shenzhen Education Conference on October 26, 2016, as part of their Fun Drawing initiative. Introducing UK Foundation teaching and learning methodologies to over 300 pre-school educationalists from throughout China, alongside other professionals from the industry. The panel discussions dealt with the challenges of the incredible growth in interest for the creative industries from a new generation of aspirational parents, keyed into the opportunities the Arts can offer their children. A practicing artist in Sculpture, Drawing and Print.